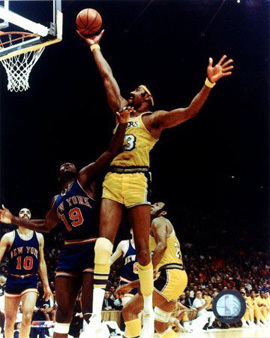 Wilton Norman "Wilt" Chamberlain was an American professional NBA basketball player for the Philadelphia/San Francisco Warriors, the Philadelphia 76ers and the Los Angeles Lakers. He also played for the Harlem Globetrotters. The 7 foot 1 inch Chamberlain played the center position and is considered by his contemporaries as one of the greatest and most dominant players in the history of the NBA.